Home Unlabelled Wearing A Bra While Sleeping? Read This! It is an old debate among the women and it is not going to stop. 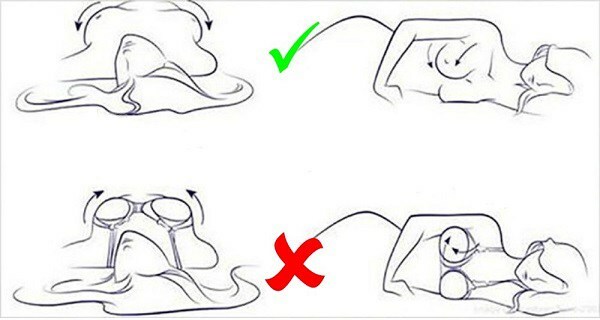 Should you wear a bra while sleeping or no? Most of the ladies are not wearing a bra when going to bed to avoid marks, the “constricted” feeling and they are also fearing from clogging the lymphatic glands leading to breast cancer. There is also the religious nighttime – bra – wearers (like Marilyn Monroe) who believe strongly that it prevents their breasts from becoming saggy. Looking at this from a scientific perspective, it seems both of these theories are just myths. Medically, the function of the lymph nodes in the underarms is to act as natural filters that drain the breast of lymph fluid, and as the body’s first defense against cancer cells, foreign material and infections. It has not been scientifically proven that wearing a bra obstructs the pathways of the lymph nodes. So scratch the breast cancer from your list of fears. What will surely cause breast sagging are breastfeeding and pregnancy, and age and genetics are the ones that determine the extent of sagging. If the size of your breasts is above C then choose a soft – cup style, without much fasteners or hardware, which will provide some support from sagging. For all others sizes, the bra is not preventing sagging in any way. sleeping in a bra or without a bra at night is really just a matter of the woman’s personal comfort. Women who suffer from rashes below their breasts from the moist skin – to – skin friction, wearing a bra can be painful, and for other that have tender breasts, they need the support bra. If you do wear a bra at night, first thing is to avoid an ill fitting and choose a soft cupped, natural fiber (all – cotton wireless) bra, that will help you keep all that moisture away from your skin. Do not Forget To Share The Knowledge As You Might Help Someone In Need!